Sheffield United manager Chris Wilder was delighted his selection gamble paid off after they hammered Reading to go second in the Championship without top scorer Billy Sharp and strike partner David McGoldrick. The Blades scored after just 38 seconds, when Kieron Freeman bundled home Mark Duffy's low cross. And they never looked back as loanee Gary Madine twice fired home before the break and John Fleck's deflected strike made it 4-0 shortly after the restart. "We try to pick the right team, always, and it got the job done," Wilder told BBC Radio Sheffield. "We had to make the right decisions for the benefit of the energy that we wanted to put into the team." Sharp is the Blades' leading marksman, with 22 goals, while McGoldrick has 11 - their 33 goals between them is just one short of Reading's tally as a team this season. But Madine, on loan from Cardiff City, proved a more than adequate back-up for them both as he scored his first two goals for the club - and first since netting for Bolton against Ipswich in January last year. "Gary has been outstanding since he walked through the door, in terms of his attitude," Wilder said. "He's not played a lot of football this season but he's getting better and better. He and Scott (Hogan) were a handful for the opposition." 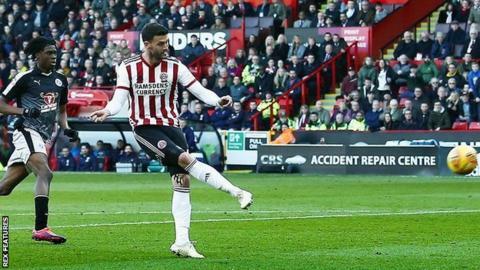 The win could have been even more convincing but for some good saves from visiting goalkeeper Emi Martinez, and lifts the Blades above Yorkshire rivals Leeds on goal difference, while Reading, who arrived at Bramall Lane on the back of a vital win over Blackburn, are one point above the relegation zone. United visit promotion rivals West Brom next Saturday, while the Royals host fellow strugglers Rotherham on the same day. "(It was) a very bad day. We didn't play well. I had to change Ovie (Ejaria) and (Liam) Kelly because they twisted their ankle, so I couldn't manage the game properly from the bench because I had just a last change. "I didn't like the game. I didn't like the way we allowed this team to play against us. "I said after the Wednesday game (against Blackburn) that we don't have much time to celebrate and now we don't have time to cry - just recover and prepare in the week to win the next one." Match ends, Sheffield United 4, Reading 0. Second Half ends, Sheffield United 4, Reading 0. Attempt blocked. Andy Yiadom (Reading) right footed shot from the right side of the box is blocked. Assisted by John Swift. Attempt missed. Lewis Baker (Reading) right footed shot from outside the box is close, but misses to the right from a direct free kick. Jón Dadi Bödvarsson (Reading) wins a free kick in the attacking half. Attempt blocked. Andy Yiadom (Reading) right footed shot from the right side of the box is blocked. Assisted by Garath McCleary. Foul by Omar Richards (Reading). Paul Coutts (Sheffield United) wins a free kick in the defensive half. Scott Hogan (Sheffield United) wins a free kick in the defensive half. Corner, Reading. Conceded by Dean Henderson. Attempt saved. Lewis Baker (Reading) right footed shot from outside the box is saved in the top right corner. Assisted by Omar Richards. Substitution, Sheffield United. Kieran Dowell replaces Gary Madine. Attempt missed. John Swift (Reading) right footed shot from the centre of the box is close, but misses to the right. Assisted by Garath McCleary with a cross. Liam Moore (Reading) wins a free kick in the defensive half. Foul by Scott Hogan (Sheffield United). Corner, Sheffield United. Conceded by Emiliano Martínez. Attempt saved. Scott Hogan (Sheffield United) right footed shot from the centre of the box is saved in the top centre of the goal. Assisted by Mark Duffy with a through ball. Foul by Liam Moore (Reading). Substitution, Sheffield United. Richard Stearman replaces Kieron Freeman because of an injury. Delay in match Kieron Freeman (Sheffield United) because of an injury. Substitution, Reading. Garath McCleary replaces Nélson Oliveira. Attempt missed. Yakou Meite (Reading) left footed shot from a difficult angle and long range on the right is high and wide to the left. Assisted by Andy Yiadom. Hand ball by Omar Richards (Reading). Substitution, Sheffield United. Paul Coutts replaces Oliver Norwood. John Swift (Reading) is shown the yellow card for a bad foul. Foul by John Swift (Reading). Scott Hogan (Sheffield United) wins a free kick on the left wing. Attempt blocked. Lewis Baker (Reading) left footed shot from outside the box is blocked. Assisted by Andy Yiadom. Modou Barrow (Reading) wins a free kick on the left wing. Foul by Kieron Freeman (Sheffield United).